Authors: Bezgodova N.V., Vtorushin S.V., Krakhmal` N.V., Purlik I.L., Latypov V.R. Background. Currently, in the study of prostate cancer, much attention is given to specific molecular patterns reflecting the biological potential of the tumor. Of most interest is analysis of the proteins of chimeric genes in a tumor. Aim of study is analysis of peculiarities of ERG and PBOV1 proteins expression in tumor cells and correlation of them with the prognostic parameters of the disease in patients. Materials and Methods. The group of study consisted of 85 patients diagnosed with prostatic carcinoma (stage II-III of the disease, T1-3N1-2M0), after radical prostatectomy. No specific preoperative treatment was given. Histological examination was conducted using a standard method, and immunohistochemical one – with use of an automatic stainer. Morphological characteristics of the tumor, of distant regional lymph nodes and of seminal vesicles were evaluated. Correlation between the histological and expression parameters of tumor and occurrence of distant metastases was studied. Results. Correlation was found between parameters of expression of the studied proteins with such variant of tumor progression as hematogenic metastasis. A higher percentage of expression of ERG and PBOV1markers in cells of prostate carcinoma correlates with a lower degree of tumor differentiation and with a poor prognosis for the course of the disease. Conclusion. The results of the conducted research demonstrate significance of ERG and PBOV1 proteins as additional prognostic factors in patients with prostate carcinoma, and probably may be used for evaluation of prognosis of the disease in selection of the management tactics for the given category of patients. prostate cancer, gene fusion proteins, hematogenic metastases, prognosis. Prostate cancer (PC) is a malignant neoplasm with rather diverse clinical manifestations, pathomorphological variants and probable patterns of tumor progression. Parameters of the overall and metastasis-free survival in patients with PC are also variable. This requires individual evaluation of the tumor potential that determines either an aggressive growth or indolent course of the neoplastic process, which, in turn, is of primary importance for making a clinical decision about treatment tactics. A study of pathomorphological and molecular-genetic markers of prognosis of tumor progression in PC, used in clinical practice, and search for new promising markers are important trends in oncology . PC has been holding leading positions in the structure of oncologic mortality in men for a long time being the second leading cause of death in the USA and Europe and the fifth leading cause of death from malignant neoplasms in the world [2,3]. Thus, in 2016, PC caused 26,120 deaths in the USA alone . However, such prevalence of PC diagnoses may «have a false ring», since an increase in the incidence of this pathology is accompanied by an increase in the number of false-positive cases . At present, morphological examination of prostate tissue is the main diagnostic method of carcinoma of the given localization, with the key role played by histological assessment of the tumor tissue by Gleason score (Modified Gleason Grading System). This method determines a sum of grades that shows the degree of differentiation of carcinoma. A high Gleason score indicates a lower degree of differentiation of the neoplasm which in turn determines a more malignant character of tumor process. A high Gleason score of carcinoma (>7 grades), their relation with an elevated level of prostate-specific antigen, detection of the signs of invasion into the capsule and seminal vesicles are regarded as markers of unfavorable prognosis and a high risk of tumor regression in PC [6,7]. Accumulated clinical experience shows that histological examination of tumor tissue specimens does not always fully reflect the degree of differentiation of the neoplasm. For this reason, in present studies of peculiarities of PC a large significance is assigned to specific molecular parameters that reflect the biological nature of tumor. One of groups of such molecular-biological markers is proteins of chimeric genes. As the analysis of literature showed, fusion genes in PC often exhibit restructure of alleles with formation of a chimeric gene TMPRSS2-ERG. TMPRSS2 is androgen-controlled serine protease (II type) which has a transmembrane position in cell and is characterized by a positive expression in the glandular structures of the prostate. In carcinoma of the given localization, a fusion of genes of transcription factors family was identified, in particular, of ETV1 and ERG, and TMPRSS2. It is known that in this situation the mentioned transcription factors participate in regulation of the levels of expression of certain genes responsible for differentiation and growth of cells . If TMPRSS2 promoterloses an allele and joins with one of ERG alleles, signs of carcinoma progression are recorded. The result of these changes is over expression of representatives of ETS family (transcription factors family) in malignantly transformed cells . These changes were reported in 42% of PC cases and in 2% of patients with prostatic intraepithelial neoplasia (PIN), but with this, such changes are extremely rare in prostate hyperplasia. Few literature data indicate probable prognostic significance of TMPRSS2-ERG and their correlation with a higher risk of recurrences with a higher lethal outcome [10,11]. The other gene is PBOV1 (prostate and breast cancer over expressed 1). Over expression of PBOV1 was found in malignant tumors of different localizations including prostate carcinoma . T. Pan, et al. (2016) showed that the level of expression of this gene may increase in malignantly modified cells of prostate tumor, while in normal cells of glandular epithelium and in benign hyperplasia of prostate the phenomenon of enhanced expression was absent. It is also known that protein-coding gene PBOV1 possesses the function of an oncogene thus determining the ability of tumor cells to accelerated division through the mechanism of suppression of cell cycle . Of note, expression of the studied gene may be also induced by influence of and rogens through mechanisms where the key role is played by transcription nuclear proteins, in particular, by FOXA-1 and FOXA-2 . Prognostic significance of the role of PBOV1 tumor protein in PC and its use in clinical practice for evaluation of the course and outcome of the disease still remain unclear. In this context, the aim of work is analysis of parameters of expression of ERG and PBOV1 proteins in tumor cells and of their correlation with the parameters of prognosis of PC in patients. A retrospective study of the operational material obtained from 85 patients (from 58 to 78 years of age, the mean age 67.3±3.7 years) with PC of II and III stage, T1-3N1-2M0, was carried out. All the patients underwent surgical treatment (radical prostatectomy with lymph node dissection) in the urological department of clinics of Siberian State Medical University (2010-2013). No preoperative treatment was given. In the postoperative period the patients remained under observation of oncologist for not less than 3 years. Cutting, preparation and staining of paraffin sections was performed using standard histological methods. Microscopic examination on the light optical level was carried out using Carl Zeiss Axio Scope A1 microscope (Germany). Morphological stage of the research included determination of the genotype of prostate tumor according to the modern WHO classification. Light microscopy was used to differentiate the degree of carcinoma in the neoplasm tissue by Gleason score, and to detect signs of extra capsular invasion into seminal vesicles. The extent of stromal infiltration was evaluated in points using a semi-quantitative method (1 point – inflammatory infiltration is minimal or absent, 2 points – moderate inflammatory infiltration, 3 – pronounced infiltration). All regional lymph nodes removed in the operation, were subject to morphological examination with the aim of detection of metastases. Immunohistological analysis of specimens of tumor tissue was carried out in the Department of Pathological Anatomy of the Tomsk Regional Oncology Center with use of immunohistostainer Bond-maX (Leica Biosystems). Antibodies ERG (rabbit monoclonal antibody ERG, CloneEP111), PBOV1 (rabbit polyclonal antibody, Abcam, ab216045) andKi67 (monoclonal antibody, Thermo Fisher, CloneSP6) were used. The result of immune staining of the antibodies in the tumor cells was evaluated by Histo-score method. Percentage of tumor cells with positive expression was evaluated (in 10 random microscope fields per 1000 cells, x400 magnification). The data were processed by Statistica 10.0 program, dispersion analysis was carried out, χ2criterion was investigated. Statistical significance was assumed to be р<0.05. In 80 of 85 patients included into the study (94.1%), the histological type of the neoplasm was acinaradenocarcinoma, in 5 patients (5.9%) rare forms of PC were found (Fig. 1). During follow-up examination, in 16 patients (18.8%) hematogenic metastases were revealed: in 13 patients (15.3% of the total patients included into the research) – isolated damage to the spine and skeletal bones, in 3 patients (3.5%) – metastatic foci in visceral organs. Morphological examination of preparations of the regional lymph node tissue showed existence of metastases in 30 patients (35.5%, Fig. 2). The analysis showed that the rate of hematogenic dissemination in patients was in correlation with some morphological parameters, e.g., the extent of differentiation of the neoplasm by Gleason score χ2=7.2; p=0.02) and existence of extra capsular spread (pT3c) in the form of invasion of the tumor tissue into the seminal vesicles (χ2=8.6; р=0.004). In examination of the morphological parameters of the tumor stroma, expressiveness of the inflammatory infiltration was not associated with the development of distant metastases (р=0.7). Percent of expression of the studied molecular markers in the tumor tissue was associated with the degree of differentiation of adenocarcinoma by Gleason score. A higher percent of expression of ERG and PBOV1 proteins was associated with a low degree of differentiation of the neoplastic tissue. Thus, percentage of expression of ERG protein was higher in tumors with a low degree of differentiation than in highly differentiated tumors (86.2±2.3 and 51.2±1.73; р=0.006). Similar data were obtained for PBOV1 protein (97.5±8.7 and 60.3±8.59, respectively; р=0.007) (Fig. 3, 4). died protein permitted to identify correlation of tumor progression with percent of expression of markers in cells of the malignant neoplasm. 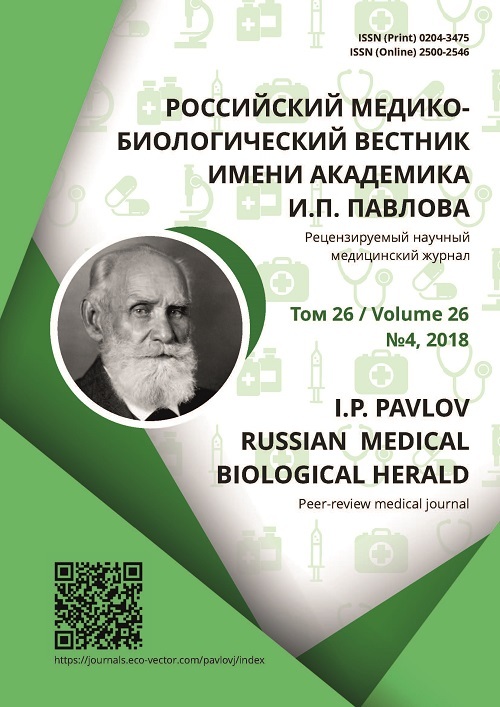 In the group of patients with metastases (M1) irrespective of localization of metastatic foci the percent of expression of PBOV1 protein was significantly higher than in the absence of signs of progression of the disease (М0): М1 – 94.5±8.8% and М0 – 67.4±12.1% (p=0.005). A similar dependence was also noted for ERG tumor protein – with the existence of remote metastatic lesions of organs and skeletal bones the percent of expression of the marker was statistically significantly higher than in the group of patients with a favorable course of the disease (83.5±2.7 and 58.3±16.6, respectively; р=0.0053). Index of proliferative activity of tumor cells evaluated by nuclear staining of tumor cells (Ki67), did not show a significant correlation with the rate of development of distant metastases (p=0.09) in our work. Fig. 4. Evident nuclear expression of PBOV1 protein in cells of acinaradenocarcinoma of prostate. So, a study of parameters of expression of ERG and PBOV1 tumor proteins being products of fusion genes, identified a number of important peculiarities. Thus, there was recorded a relationship between expression parameters of the studied proteins and such variant of tumor progression as hematogenic metastasizing. The data obtained in research showed that a higher percent of expression of ERG and PBOV1 markers in cells of prostate carcinoma is associated with a lower degree of tumor differentiation. It is most probable that change in percent of expression of the studied proteins in PC with low differentiation of the tumor tissue and with appearance of distant metastases, is associated with derangement of balance in the mechanisms of signal pathways participating in differentiation and proliferation of tissues, with increase in invasive properties of tumor cells, and reflects their higher metastatic potential. A high percent of tumor cells with positive expression of ERG and PBOV1 proteins in PC with hematogenic metastases shows that over expression of these markers is associated with unfavorable variant of the course of the disease. The results of conducted research demonstrate significance of ERG and PBOV1 proteins as of additional prognostic factors in patients with prostate cancer and may probably be used for evaluation of prognosis of the disease when selecting management tactics for this category of patients. Cheng L, Koch MO, Juliar BE, et al. The Combined Percentage of Gleason Patterns 4 and 5 Is the Best Predictor of Cancer Progression After Radical Prostatectomy. J Clin Oncol. 2005;23(13):2911-7. doi: 10.1200/JCO.2005.03.018. An G, Ng AY, Meka CS, et al. Cloning and Characterization of UROC28, a Novel gene Overexpressed in prostate, Breast, and Bladder Cancers. Cancer Research. 2000;60(24):7014-20. Samusik N, Krukovskaya L, Meln I, et al. PBOV1 Is a Human De Novo Gene with Tumor-Specific Expression That Is Associated with a Positive Clinical Outcome of Cancer. PLoS ONE. 2013;8(2): e56162. doi: 10.1371/journal.pone.0056162. Tomlins SA, Rhodes DR, Perner S, et al. Recurrent Fusion of TMPRSS2 and ETS Transcription Factor Genes in Prostate Cancer. Science. 2005;310(5748): 644-8. doi: 10.1126/science.1117679. Torre LA, Bray F, Siegel RL, et al. Global cancer statistics, 2012. CA: A Cancer Journal for Clinicians. 2015;65(2):87-108. doi: 10.3322/caac.21262. Suh YS, Joung JY, Kim SH, et al. Establishment and Application of Prostate Cancer Circulating Tumor Cells in the Era of Precision Medicine. BioMed Research International. 2017;2017(6):1-9. doi: 10.1155/2017/7206307. Cross DS, Ritter M, Reding DJ. Historical Prostate Cancer Screening and Treatment Outcomes from a Single Institution. Clinical Medicine & Research. 2012;10(3):97-105. doi: 10.3121/cmr.2011.1042. Hessels D, Schalken JA. Urinary biomarkers for prostate cancer: a review. Asian Journal of Andro-logy. 2013;15(3):333-9. doi: 10.1038/aja.2013.6. Kumar-Sinha C, Tomlins SA, Chinnaiyan AM. Recurrent Gene Fusions in Prostate Cancer. Nature Reviews Cancer. 2008;8(7):497-511. doi: 10.1038/nrc2402. Siegel RL, Miller KD, Jemal A. Cancer Statistics, 2016. CA: A Cancer Journal for Clinicians. 2016; 66(1):7-30. doi: 10.3322/caac.21332. Mwamukonda K, Chen Y, Ravindranath L, et al. Quantitative expression of TMPRSS2 transcript in prostate tumor cells reflects TMPRSS2-ERG fusion status. Prostate Cancer Prostatic Diseases. 2010; 13(1):47-51. doi: 10.1038/pcan.2009.28. Hoogland AM, Kweldam CF, van Leenders Geert JLH. Prognostic Histopathological and Molecular Markers on Prostate Cancer Needle-Biopsies: A Review. BioMed Research International. 2014; 2014:1-12. doi: 10.1155/2014/341324. Pan T, Wu R, Liu B, et al. PBOV1 promotes prostate cancer proliferation by promoting G1/S transition. Onco Targets and Therapy. 2016;2016(9):787-95. doi: 10.2147/OTT.S92682. Demichelis F, Fall K, Perner S, et al. TMPRSS2: ERG gene fusion associated with lethal prostate cancer in a watchful waiting cohort. Oncogene. 2007;26:4596-9. doi: 10.1038/sj.onc.1210237. Copyright (c) 2018 Bezgodova N.V., Vtorushin S.V., Krakhmal` N.V., Purlik I.L., Latypov V.R.